Growing up in the small farming community of Oskaloosa, KS, James Reynolds saw a future in sports. But when the All-State high school football player came home from serving in Vietnam, he enrolled in Topeka’s Washburn University as a prelaw and journalism major. It was there that he got a tip on how to meet girls: join the theater department. In addition to scoring dates, Reynolds discovered his passion for performing. Plays and musicals followed, then Reynolds left school and moved to San Francisco to pursue his new vocation. Family matters soon brought him home to Kansas, where he put his journalism experience to use at the Topeka Daily Capitol, covering the arts. In 1974, he scored a role in the Charles Bronson film Mr. Majestyk, then moved full time to Los Angeles. After appearing in a host of popular prime-time shows, Reynolds was cast as DAYS’s upstanding cop Abe Carver in 1981, a role he still relishes two decades later. When he’s not in Salem, Reynolds keeps busy with charity work, including work with the Department of Veterans Affairs. 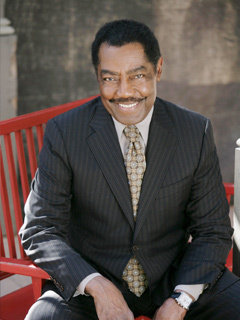 Abe is the longest-running African American character on soaps. Is a former Marine and Vietnam vet. He and wife Lissa are Artistic Directors of the Fremont Centre Theatre in South Pasadena, CA. Had emergency heart valve replacement surgery in 2007. Was nominated for a Lead Actor Emmy as GENERATIONS's Henry in 1991 and a Supporting Actor Emmy as DAYS's Abe in 2004.